Adventure Time tackles train dungeons and blows our minds. Here’s what’s up in the world of TV for Monday, September 30. All times are Eastern. 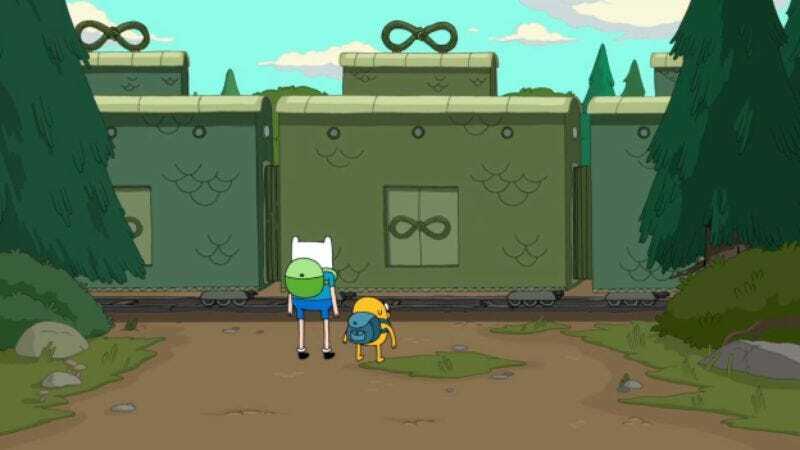 Adventure Time (Cartoon Network, 7 p.m.): Finn fights a train made of dungeons! Maybe it’s a metaphor for the Internet. Like, the dungeons are the echo-chambers of self-righteous Twitter outrage, and Finn can only defeat them by entering each one and slaying its @-replying boss monster. Jake is bored, too, which sounds about right. As Oliver Sava points out, dogs don't really like Twitter. Regular Show (Cartoon Network, 7:30 p.m.): There’s some time-traveling and some brain-freezing. Alasdair Wilkins has never heard of two hyphenated gerund phrases that have less to do with each other. How I Met Your Mother (CBS, 8 p.m.): The gang prepares for Robin and Barney’s wedding with the meeting of the in-laws, and Lily finds Ted’s bucket list of things he wants to do while he’s still in New York. As certain members of the TV Club staff are also making the move from New York to Chicago, this sounds like a Very Special Episode of How I Met Your Mother. Donna Bowman, fortunately, has no idea what the hell we’re talking about. Mom (CBS, 9:30 p.m.): The description of tonight’s episode promises a “family crisis,” while the title promises “A Pee Stick And An Asian Raccoon.” Todd VanDerWerff is regretting his life choices. The Blacklist (NBC, 10 p.m.): Isabella Rossellini guest-stars in the second episode of this potentially terrible spy drama. Phil Dyess-Nugent almost put her on his list of five, but then he got it laminated, but maybe she’ll understand? Hostages (CBS, 10 p.m.): FBI agent-turned-terrorist-assassin Duncan Carlisle waves his gun around and makes a bunch of threats to Dr. Sanders’ family. As the episode is called “Invisible Leash,” we can only assume that they have been put into an invisible doghouse, with an invisible dog bowl, and maybe there is an invisible dog as well? Sonia Saraiya is not interested unless there is an invisible dog. Dancing With The Stars (ABC, 8 p.m.): The stars, they dance! Tonight’s two-hour live show has an elimination amidst the performances, ominously themed “Hollywood Night.” We’re not covering this, but maybe we should be. Bones (Fox, 8 p.m.): Bones is still chugging along, with an episode tonight about a “carcinero” in a “coche,” whatever that means. It’s not like the show is called Huesos, am I right? Though actually, maybe that would be interesting. We Are Men (CBS, 8:30 p.m.): CBS trots out another sitcom, about four single women. Just kidding, it’s about men! Psych! Check out Erik Adams’ preview of the first season, in which he gave it an abysmal D-plus. Which means you absolutely must watch it. Genealogy Roadshow (PBS, 9 p.m.): People learn about their ancestors and family histories with a wacky touring panel of mystery-solving experts! Tonight, Detroit: Where one woman asks the panel to investigate the claim that she’s related to Abraham Lincoln, and another discovers that an ancestor was charged with murder. Castle (ABC, 10 p.m.): The Castle and Beckett Romance Drama Of The Century continues as Castle lays dying after being exposed to a toxin and Beckett runs around trying to save his life. Hocus Pocus (Lifetime, 8 p.m.): It’s not even October, but we’re already into the full-swing of Halloween-themed movies. Come for the wisecracking Bette Midler singing “Put A Spell On You,” stay for Kathy Najimy riding a vacuum, in lieu of a broom. There is also a talking cat, but we try to forget that part. The Bodyguard (Fuse, 8:30 p.m.): It’s never too soon to mourn once again for the untimely death of Whitney Houston and the inexplicable popularity of Kevin Costner. Monday Night Football: Dolphins at Saints (ESPN, 8:25 p.m.): Football! Is a sport! That is very popular and important! But we will be imagining this game as if a pod of smiling killer dolphins swam from Miami up the Mississippi Delta to attack a cadre of somber killer saints. Like St. George. He probably would have been into football. Breaking Bad (Sunday): Oh yeah, this little-known, critically reviled show finished its run last night without any fanfare or live-tweeting or mass hysteria of any sort! Donna Bowman had the thankless task of reviewing something no one else cares about.